TradePlus Online is one of the well-known discount broker based out of Chennai. 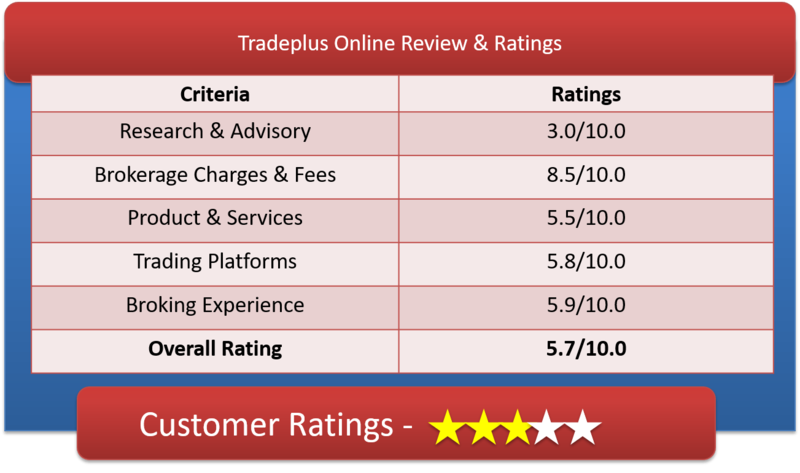 Let’s have a detailed Trade Plus Online Review & get good understanding of TradePlus Online Brokerage Charges, TradePlus Online Demat Account, TradePlus Online Trading Platforms & other important features. Trade Plus Online is one of the leading stockbroker. Trade Plus Online has plenty of efficient brokers with 40,000 clients across India. They started into Financial Service Industry in 1983 but became Equity Broker in 1995. Presently, the company CEO is S K Hozefa. Trade Plus Online is providing fully automated computerized trading platform to its client to trade in various segment. This platform uses NEST traders for trading. You can make buying, selling, observation and trading on this platform. Open Trade Plus Online account for trading with zero opening fees. Trade Plus Online is among lowest trading plans with unlimited equity option, currency and commodity. Margin against share is available and it covers through order this helps you trade more with little money. Here the price of share increases and you use the same money to trade as well. NRI trading option is available here from Trade Plus Online. They have innovative brokerage plans and you can request a free call back from trade plus where your bargain skills will be tested to the best. Pay no brokerage for delivery trades (sounds cool to ears but are true as well). They have trading and back office facility and best service to offer to both amateur and expert traders. They are the members of NSE, BSE, MCX and NSDL. In 2017, they have launched INFINITE trading and MF solutions. Trade Plus Online was honored with NSDL Star Performance Award in 2013, 2015 and also in 2016. The unlimited trading plan is the most famous refundable plan (yes refundable when not used) you can get in the trade plus online. They have excellent customer support during your trading periods. Their qualified experts will provide you the proper investment plan. They assist you during the trade online. They have unique trade plus features. You can take the advantages of the best trading feature to execute your trade and the operation is really easy to understand. Their technical analysis will serve you during the trading, as they have good success rate for the tips they provide. Trade Plus Online has subscription portal for its clients. This will allow clients to deactivate and then reactivate their services such as alerts, SMS, many other packs. Trade Plus Online offer many cash back offers to their clients. Trade Plus Online provides the exclusive discount brokerages for an excellent trading online. Equity Brokerage – In Intraday (0.01%) and Delivery (0.10%), has low brokerage charge on equity trading that is Intraday Leverage upto 33X and Delivery Leverage upto 4X. NOTE: If you don’t trade, you get 100 % refund on monthly subscribed fee. TradePlus charges INR 650 for opening a trading account and the AMC is Nil. For DEMAT account, there are no account opening charges but an AMC of INR 400 per annum. How to open Demat account with Trade Plus Online? This Entire process takes 5 or 7 days to complete. Why Open TradePlus Online Trading Account? NRI trading service with client base facility. Zero brokerage plans in commodity trading. Account opening in 15 mins and Demat account service with zero amounts. Mutual Fund/IPO/Bond investments online possible. This will provide you a great trading experience and this platform is good for market information and complete analysis for equity and commodity. It provides you fundamental insight of equity and commodity segment. It is an EXE based trading platform. Here you can check your DP related and Ledger related feature and options. Apart from these 4 platforms, there are few others provided by the broking house. Powered by NSE, a platform for trading on both NSE & BSE. It is good for investors to trade in Equity, Equity Derivatives & also Currency Derivative. By Omnesys Technologies – for commodity segment, whose features are not chargeable. A unique alert management system for better and safe trading. Here is the list of Support they provide to their client. Here are the total number of complaints lodged & resolution status of Trade Plus Online for the current year. The broking house do get sizable volume of complaints but they are not able to resolve the issues very fast. NOTE* – Their TAT for resolving any kind of complaint is 30 days. Their feedback team to be agressive towards resolving client complaints. Here are the list of pros & cons of the broking house. Has an advisory system for guiding investor on what MF to opt for and what amount to be insured, etc. Tradeplus Online is not a major discount broker but they are doing a very good work to increase their client base & revenue. Their client rating is at 5.7 of 10. Our vast experience shows that open demat account with Tradeplus online only if you are 100% convinced that other brokers are not competitive. Traders community are recommended & not Investor community for account opening with this broking house.